“My Name Is America” Philly, NY, GA and more! Thanks for taking the time to read our latest update! Things haven’t really slowed down, we just have shows in Panama City Beach, FL 6 nights a week, so keeps us busy! It’s been good to see all of you who have come down for vacation! We have lots of exciting news and things still happening with “My Name Is America!” It is really a good feeling to be a part of a positive thing for America! It’s so great to see Americans showing their pride too. Recently Todd was asked to come to Philadelphia, PA to sing “My Name Is America” at The Delaware County Community Foundation Salute to Veterans Gala Honoring Claude de Botton with the Gary Papa Leadership in Philanthropy Award! We even get a tour of the city! Very excited for that! Of course we are still super excited to be part of the 126th Anniversary Celebration of the Statue of Liberty on October 28 of this year! We also found out that this will be the Grand Re-Opening day, because she has been closed for renovations since that time last year! What an honor! When we get more details we will let everyone know more for sure. The official Video on YouTube now has 551, 416 + Views! Again we are so proud to have been blessed to be a part of this wonderful song and it’s journey! Here is the link once again if you would like to Share it on FaceBook or in an email: http://www.youtube.com/watch?v=6TPgJSZf5Vw. Let’s keep the positive message going! We recently received and email from a gentleman who is using our song in his light display at his home. We think it’s very cool to show your America Pride! Here is the link for his video of his display: http://vimeo.com/43953219 . We also thank him for sharing his use with us. This past Saturday June 16 Todd was invited to be a part of the “Georgia Honors Iraq Veterans and their Families” in Rome, GA. They wanted him to bring the bus and be a part of the parade. We did! We had “My Name is America” playing out the windows all the way and Todd was inside the bus moving from side to side out the windows waving and thanking the troops. It was such a neat experience and very moving to see all who came out in the town to help welcome home the heroes! And afterwards there was a big celebration ceremony at The Forum (Civic Center type venue). Todd sang “My Name Is America” as part of the ceremony. The ceremony included performances from the U.S. Army Band, a Gold Star Mom, Patty Sailor, singing the National Anthem, The Mayor, Evie McNiece, of Rome speaking, Major General Butterworth speaking, a song from a fallen soldier’s brother, Congressman Tom Graves speaking and Governor Nathan Deal of Georgia was also there to thank these heroes. It was an honor to be in such great company, not to mention the company of the men and woman who we were honoring! Below we have included pictures and here is a link to a very cool video presentation we put together of the event: http://www.youtube.com/watch?v=wRpQRa7er0M . We hope you enjoy! Don’t forget you can get your copy of the CD, DVD or Sheet Music of “My Name Is America” at www.mynameisamerica.us. Check out our full Show Schedule at www.toddallenherendeen.com . We perform Tuesdays, Thursdays and Saturdays at Gulf World Marine Park’s Beautiful 675 seat indoor Branson style theatre! You won’t want to miss our concerts at this incredible venue, it’s quite a production! Starting mid August we hit the road for some exciting shows around this beautiful country! September 7 we will be in Van Wert, OH for the Van Wert Hot Air Balloon Festival! Check it out here: http://vanwerthotairfestival.com/?p=315. We continue the journey. Keep us in your prayers! Marine Aviation Centennial AND Todd Singing at Statue of Liberty!! As always, we thank you for taking the time to share our journey with us! Without our friends and fans we would be nothing! Our Song “My Name Is America” continues to take us down many roads. We are so pleased to see the Lord using it for His purpose! If this is your first time reading our blog, please visit www.toddallenherendeen.wordpress.com to see many of the past incredible places this song has taken us. Most recently Todd was invited to sing it at the Marine Aviation Centennial Celebration. It honored 100 years since the Marines first flight. It was and incredible evening and event that included many Generals, Lieutenant Colonels, and 200+ Marines serving our wonderful country. The evening included dinner, speeches, and special presentations for two families who had lost their sons. The families were presented portraits of theirs sons by the artist who did them, after a moving presentation about the life of these young men who had given their lives. It was an evening of tears, fun, honor and pride. We sincerely enjoyed it and were honored to be able to be a part of it. We wish every American could have the chance to experience the loyalty, honor and pride these men and woman share for their friends and country! Don’t get us started, on supporting our veterans and active service members 🙂 haha. They told Todd and Angel they were honored they came and sang the song, but Todd and Angel were so much more humbled and honored to have been there! Thank you to Lt.Col. Raz for asking us to be a part of the fantastic night! The night was also a fundraiser for the Marine Aviation Memorial Tower to be put up in Pensacola, FL. Visit this web site to learn more or make a donation: http://www.honorourmarines.org/McCutcheon_Squadron/Welcome.html. Below are some pictures from the event. We have more exciting and unbelievable news! Todd has been asked to sing “My Name Is America” at the BASE OF THE STATUE OF LIBERTY in New York on October 28, 2012 for the 126th Anniversary Celebration! We are so excited and, again we use the word honored, but there is no other way to describe the incredible events we get asked to be a part of!! As we get all the details in, we will be updating the schedule and sharing details. May 22 begins our Summer Schedule in Panama City Beach, FL. We will be performing at Gulf World Marine Park every Tuesday, Thursday and Saturday and at the Holiday Inn Resort for Resort Guests on Monday, Wednesdays and Fridays. We do have certain Black out days that we have to travel, and shows and events coming up frequently with “My Name Is America” on a National level, so please check www.toddallenherendeen.com frequently for an updated schedule. We look forward to seeing you as you make Panama City Beach, FL your vacation destination! Don’t forget you can order your copy of “My Name Is America” on CD or DVD, as well as sheet music, at www.MyNameIsAmerica.us, the official site of the song! Also Here is the link for the video on YouTube that you can Copy and Share: http://www.youtube.com/watch?v=6TPgJSZf5Vw. WE would really appreciate the help in sharing it! We appreciate you taking the time to follow our journey with our song ” My Name Is America!” We Hope if this is your first time here to our blog that you will scroll around and look at some of our past posts of where the song has taken us so far! You can also look to the right of the page and Enter Your Email address where it says “Follow Blog” and you will get new posts sent directly to your email. “My Name Is America” now has over 435,000 views on YouTube! We are very proud that people are sharing it via emails all over the world. But if you think about how many millions of people are out there, that need to hear the message of the song, you can see we still have a lot of work and a long way to go! It can only happen with YOUR HELP! Together we CAN spread this message! All you have to do is copy and paste this link http://www.youtube.com/watch?v=6TPgJSZf5Vw in an email and then EMAIL IT to ALL of your Friends! This is a very important time in our American History, be a working part of it! We thank all of you who are helping America through many ways. This is our way and we want you to be a part of it. Two rival North Carolina politicians with presidential aspirations tangle with one another. With the PRINICIPAL CAST: Will Ferrell, Zach Galifianakis, Dylan McDermott, Brian Cox, Jason Sudeikis, John Lithgow, Dan Aykroyd, Sarah Baker, Katherine La Nasa, Kate Lang Johnson. After careful consideration and a lot of research and meetings, we came to the conclusion that we would not accept and let them use the song. We are very serious about the song’s message and positive stance for America. We would not want it to become a joke or make fun of America. We have high respect for those who serve America in so many different ways and this song has always been dedicated to them and we don’t want it tainted in any way. So we are very very pleased it attracted Hollywood’s attention, but all that glitters, as they say, is not gold. 🙂 So we feel we made a respectable decision to keep the integrity of the song very high! Pretty cool feeling though, when they want to put your song in a movie 🙂 Check out the documents below to see more. Again we did not give them the rights to use the song and are very comfortable with that decision. 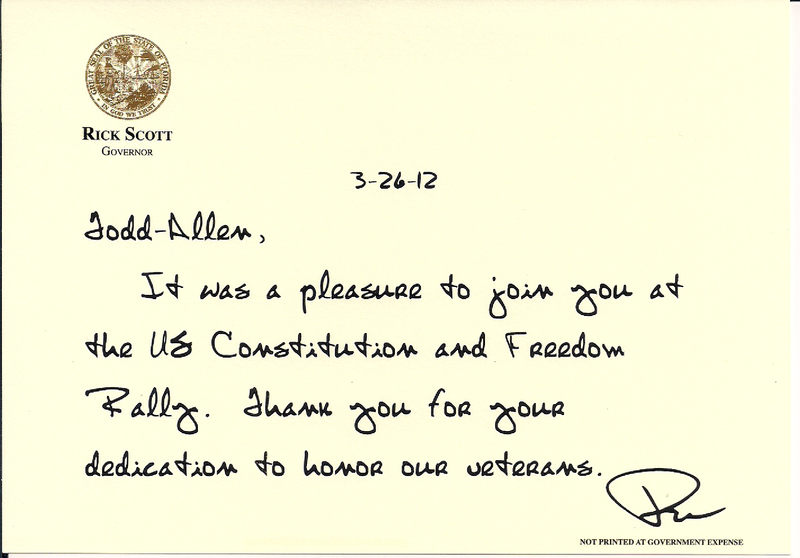 Last week Florida Senator Marco Rubio was in Panama City, FL and Todd was invited to be there. Below is their photo. Speaking of Panama City, Todd will be performing his show every Thursday at Gulf World Marine Park’s 675 seat indoor, state-of-the-art theatre in Panama City Beach, FL! You can check out Todd’s full schedule at www.ToddAllenHerendeen.com. Throughout the summer season, Todd and his band perform 6 nights a week in Panama City Beach, FL (tourists come by the droves!) They are also the house show at Holiday Inn Resort in Panama City Beach. If you stay at the resort, you get to see the show there on Wednesdays and Fridays. Again all info can be found on Todd’s website. If you haven’t been to Panama City Beach, FL, there is no other beaches as beautiful! White soft sand and beautiful clear emerald waters of the gulf! We had to include a photo below, so you can see what you’re missing! Don’t forget we have CD’s, DVD’s and sheet music, both SOLO and SATB For Sale at www.mynameisamerica.us! We also offer Bulk rates for purchases of 30 or more items. Just send us an email from the website to inquire about that. A Lot of museums and veterans organizations have ordered bulk. We are happy to help! As always, keep us and our great country in your prayers!